Do You Believe in Nanomachines? You Should. To the disgruntled pessimists who like nothing better than to see the future in the most dire terms possible, and who do not believe that nanomachines that can ever operate in the human body to destroy pathogens, repair DNA and otherwise make us better, faster, smarter, more durable and long-lived will ever become reality, I say: Nanomachines that operate inside the human body already exist. They comprise what is called the existence proof of the feasibility of such technology. I am referring of course to existing protein machines. Ribosomes, for example, are molecular machines found in all cells which build protein molecules according to instructions (programming) read from RNA molecules. They themselves are complex structures built of protein and RNA. 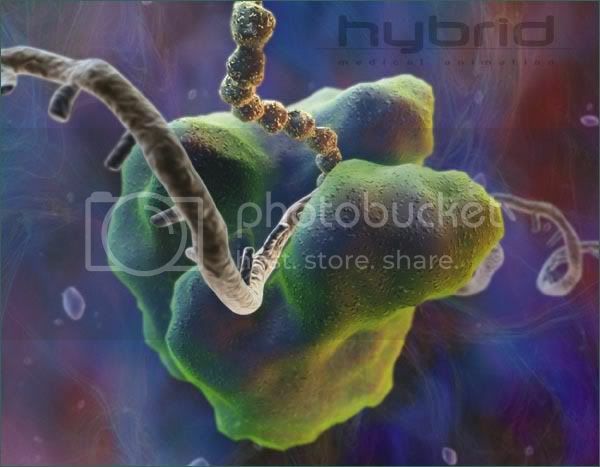 Below is an image of a ribosome. Another existing nanomachine is the T4 phage. Seen below, this little guy is a virus that acts like a spring-loaded syringe and, according to K. Eric Drexler, author of Engines of Creation, looks like something out of an industrial parts catalog. The virus can stick to a bacterium, punch a hole, and inject viral DNA. When we try to imagine nanomachines, we often picture tiny robots, complete with nanoarms and nanohands with which to assemble things. But nanoarms and nanohands aren't needed. The existing nanomachines we've just seen are, in fact, self-assembling. Molecular biologists "have taken the machinery of the ribosome apart into over 50 separate protein and RNA molecules, and then combined them in test tubes to form working ribosomes again." To see how this happens, imagine different T4 protein chains floating around in water. Each kind folds up to form a lump with distinctive bumps and hollows, covered by distinctive patterns of oiliness, wetness, and electric charge. Picture them wandering and tumbling, jostled by the thermal vibrations of the surrounding water molecules. From time to time two bounce together, then bounce apart. Sometimes, though, two bounce together and fit, bumps in hollows, with sticky patches matching; they then pull together and stick. In this way protein adds to protein to make sections of the virus, and sections assemble to form the whole. The problem with these protein-based entities, and in fact all protein-based life, is that proteins are not very durable, strong, or intelligent. Which is why the concept of building nanomachines out of carbon nanotubes is so important. 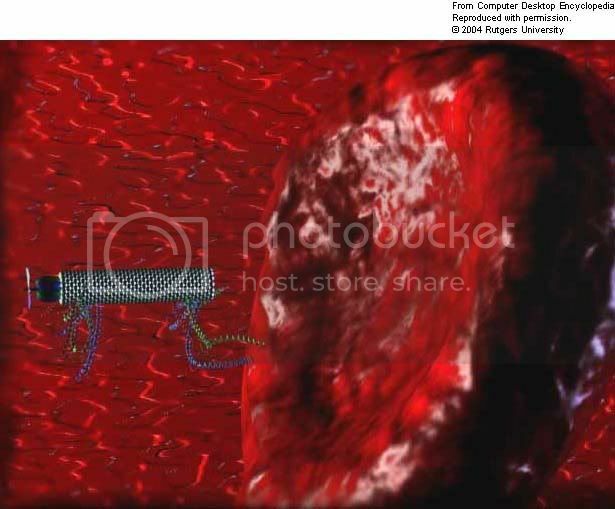 Below is a conceptual image of a carbon nanotube nanobot, the likes of which scientists at Rutgers University believe will be injected into the bloodstream to administer drugs directly to an infected cell. They envision this happening by 2020. What is amazing to me is that the general public, and even much of the scientific community, is unaware of the progress already being made. When they are first introduced to the concept of nanomachines operating inside the human body, and are apprised of how soon this will occur, many react as if it is downright nonsense. But it isn't. It's coming sooner than you think. I for one am among the expectant throng of those who believe. There are two things we can be sure of. Sooner or later it will be abused, and the consequences will be severe. Nanomachines can be used in much sinister ways like killing tens of millions of people without the use of nuclear weapons... Cheaper, cleaner, quiter, and more efficient. The ultimate destruction tool. i'm slightly reassured and happy to read the previous posts. thank you for sharing those insights everybody. i agree, this tech could potentially do wonderful things and save the world....BUT name ONE technology that has truely followed this path to fruition, before being siezed/corrupted/controlled and implemented to serve selfish or evil ends. morgellons may be the first documented case of such an abuse regarding nanotech, unless genetically modifying our food and killing the bees counts for anything. well i guess that's not nano. i digress. the point is, the only technologies that serve the good of everybody, are the ones that are openly available to everybody...not just elites and corporations with nefarious agendas and the clout to carry them out! my sympathy goes out to the canaries in the nanotube, the ridiculed victoms of morgellans. oh and one more thing, that second picture of the T4phage, i am pretty sure is the nasty beastie being sprayed on your lunchmeats and similar products right now, to kill bacteria that grows in those nasty products. little is revealed about the research into what those bacteria-killing nanos do to vital GOOD/HEALTHY bacteria present in our gut etc. The only "proof" I see in this article is its authors stupidity. Once again Cartesian ignorance rears its ambitious head... Proteins, the building blocks of life, are much more than machines you %$#@ moron. Ignore this fact at the expense of all life on this planet. "The only "proof" I see in this article is its authors stupidity. Once again Cartesian ignorance rears its ambitious head... Proteins, the building blocks of life, are much more than machines you %$#@ moron. Ignore this fact at the expense of all life on this planet." You may find solace in this: I won't be the one building them. It never ceases to amaze me at the unrepentant egos of scientist types, or really anyone who spent a long time learning stuff (like doctors). Because they worked hard what they think MUST be right. They can't even get genetically modified food to work right without organ damage and infection of non-GM crops. Why would they be able to do this any time soon? And why when cheap natural cures and proper diet solve most of the problems they are trying to fix? But that doesn't make a huge profit, which is what is all about. Eric Drexler included a chapter in his book "Engines of Creation" titled "Engines of Destruction". Knowing the potential of exponential self replicating nano machines makes for a run a way system unless controlled by a computer. He also mentions the potential reaction of those countries who do not have a nano weapon probably being in the position of preemptively attacking and destroying the country that posesses such a weapon in a move for survival. The Borg in Start Trek were also formed due to nanomachines that took over biological entities in the pursuit of perfection. This is about as far away from reality as dogs eating with chops sticks... nanomedicine will not look anything like Rob Freitas.... it'll be much more hairy. Too bad so many scientists are intelligent, but not smart enough to see the mega-darkside of their "wonder cures."